Like well-heeled raccoons, celebrities covet the shiny, the sparkly, the blinged-out. Double-digit carats? Yes, please! Putting precious stones in places they were never meant to be? Let's do it! Such is the logic of those stars who seem to buy jewelry based on shock value, not beauty. Kim Kardashian and Kris Humphries dropped jaws this week when they revealed that he proposed to her with a $2 million, 20.5 carat diamond dazzler. (Who knew carats ran that high?) He shared his motivation for the purchase with People magazine: "I just knew I wanted it to be big!" It's the ring that could create a paparazzi entourage of its own. Designed by Kardashian's friend, celebrity jeweler Lorraine Schwartz, the reality TV star's newest accessory includes a 16.5 carat emerald cut center stone flanked by a pair of 2-carat trapezoids. NBA baller Humphries reportedly dished out $2 million for the diamonds, to Kardashian's delight. "It's the most beautiful thing I have ever seen," she told People. "It's perfect." Some kids get stuffed animals of their favorite cartoon character. Justin Bieber gets a diamond-and ruby-encrusted pendant. The teen pop sensation reportedly dropped $25,000 on a jeweled rendition of "Family Guy's" lovable baby curmudgeon Stewie. Beverly Hills jeweler Jason Arasheben told TMZ.com that Bieber designed the piece himself, selecting multi-color rubies and white diamonds to be set in 14-carat gold. Mariah Carey and self-restraint don't exactly get along. (Exhibit A: That infamous episode of MTV Cribs.) It makes sense, then, that earlier this month, to celebrate her first Mother's Day, Carey's husband, Nick Cannon, went over the top. He bought a $12,000, 4-carat diamond and sapphire necklace from Arasheben (the same jeweler Bieber visited) that spells out the names of the couple's new twins: Moroccan and Monroe. A bit tacky? Maybe. But it's a way better gift than a bedazzled Cuisinart. Unsatisfied with blingy-Jesus pieces and iced-out watches, Kanye West upped the ante for hip-hop's bauble brigade last year when he had the bottom row of his teeth taken out and replaced with diamonds. (Really. Permanently. One wonders what his dental hygiene routine is like.) While a dentist doubted that West yanked out his chompers altogether to get the precious metals in his mouth, the rapper may have paid upward of $60,000 for his shinier-than-all-get-out smile. Why? He told Vanity Fair, "I just like diamond teeth, and I didn't feel like having to take them out all the time." Of course, Hollywood drooled for jewels long before the current crop of stars ran the town. The late Elizabeth Taylor's lust for gems is the stuff of legend. One of her most memorable pieces was the Taylor-Burton diamond, a 69.42 carat pear-shaped diamond that Richard Burton purchased at a 1969 auction for more than $1 million. The diamond was originally set in a ring, but even Taylor couldn't pull off a rock of that size. She had Cartier refashion it as a necklace and wore it to the Academy Awards in 1970. But as with Burton, this diamond was not to be Taylor's forever. Following her first divorce from the actor (they married and divorced twice), Taylor put the diamond up for auction, selling it for a reported $5 million. 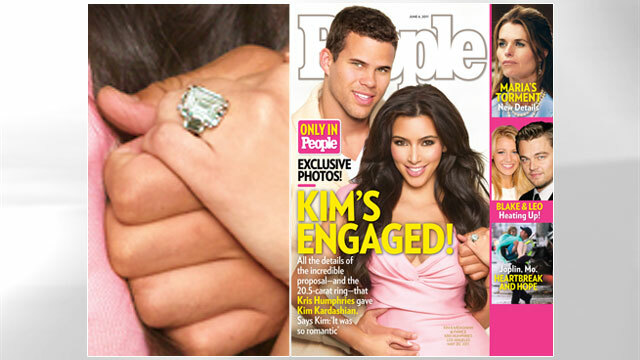 Kim Kardashian's 20.5 Carat Ring: Cute or Crazy?